The tetraspanin CD81 has been involved in T-dependent B cell-mediated immune responses. However, the behavior of CD81 during immune synapse (IS) formation has not been elucidated. We determined herein that CD81 redistributed to the contact area of T cell-B cell and T cell-dendritic cell conjugates in an Ag-dependent manner. Confocal microscopy showed that CD81 colocalized with CD3 at the central supramolecular activation complex. Videomicroscopy studies with APC or T cells transiently expressing CD81-green fluorescent protein (GFP) revealed that in both cells CD81 redistributed toward the central supramolecular activation complex. In T lymphocytes, CD81-GFP rapidly redistributed to the IS, whereas, in the APC, CD81-GFP formed a large accumulation in the contact area that later concentrated in a discrete cluster and waves of CD81 accumulated at the IS periphery. These results suggest a relevant role for CD81 in the topography of the IS that would explain its functional implication in T cell-B cell collaboration. Immune response is initiated by the specific interaction of T cells and APCs. During the T cell-APC interaction, a highly organized structure is formed at the interface of both cells, termed the immune synapse (IS)3 (1). This cell-cell contact area has two spatially segregated regions. The central zone contains the TCR, costimulatory molecules, and signaling molecules. This area, known as the central supramolecular activation complex (c-SMAC), is surrounded by a ring of adhesion molecules such as LFA-1 integrin, the peripheral-SMAC (p-SMAC) (2). CD81 is a member of the tetraspanin superfamily of proteins that have been implicated in several cellular functions as cell growth, differentiation, intercellular cell adhesion, motility, and intracellular signaling (3, 4, 5). All of these functions seem to relate to the capacity of tetraspanins to form complexes with other cell surface receptors, including integrins, Ig proteins, and other tetraspanins (3, 4). Thus, CD81 physically associates with CD4 and CD8 (6) and provides a costimulatory signal in T cells (7). On B cells, CD81 associates with CD19 and CD21 to form the B cell coreceptor (8) and with MHC class II molecules in APCs (9). Recently, it has been proposed that tetraspanins form microdomains with MHC class II molecules that facilitate Ag presentation (10). Moreover, CD81 promotes T-B cell collaboration by activating LFA-1 integrin (11). Although CD81-deficient mice exhibit normal maturation of all lymphoid cells, they show a decreased Ab production in response to protein Ags (12, 13). Hence, chimeric mice in which only B cells lacked CD81 have reduced Ab production upon exposure to a Th2 stimulus (14). Lately, it has been reported that CD81−/− TCR-transgenic T cells show a diminished synthesis of IL-4 when activated by CD81+/+ B cells. In contrast, CD81−/− B cells are able to induce normal levels of IL-4 synthesis by CD81+/+ T cells (15). All of these data strongly suggest that CD81 has an important role in T-APC interaction. However, the dynamic behavior of CD81 during the formation and establishment of the IS has not been addressed yet. We report herein that CD81 localizes at the c-SMAC, as determined by three-dimensional (3D) confocal microscopy analyses. Moreover, transient transfections of CD81-green fluorescent protein (GFP) in APCs and T cells revealed that both cell types contributed to the clustering of CD81 at the central area of the IS. These data implicate CD81 in the IS and would explain the CD81-deficient mouse phenotype. The Jurkat-derived human T cell line Vβ8+ J77cl20 and the lymphoblastoid B cell line Raji (16), have been previously described. Murine Th cell clone SR.D10 and the I-Ak-transgenic B lymphoma cell line TAK (17) were kindly provided by Dr. J. M. Rojo (Centro de Investigaciones Biológicas-Consejo Superior de Investigaciones Cientificas, Madrid, Spain). Human monocyte-derived dendritic cells (DC) were generated as described elsewhere (16) and matured with LPS (10 ng/ml) (Sigma-Aldrich, St. Louis, MO) for 36 h. The S3085B (S3) human cell clone was isolated from polyclonal superantigen staphylococcal enterotoxin B (SEB)-specific primary T cells (16). The following mAbs were used: T3b (anti-CD3), TP1/40 (anti-CD11a), and D3/9 (anti-CD45). I33.22 (anti-CD81) was kindly provided by Dr. R. Vilella (Hospital Clinic, Barcelona, Spain), FN1 by Dr. S. Funderud (Norwegian Radium Hospital, Oslo, Norway), anti-giantin by Dr. G. Egea (IDIBAPS, Universidad de Barcelona, Spain), and rat anti-mouse ICAM-1 by Dr. D. Vestweber (University of Munich, Munich, Germany). Anti-mouse CD81 (Eat2) and anti-mouse CD3 (2C11) were purchased from BD PharMingen (San Diego, CA). DCIS 1/21 (anti-MHC class II) was generated in our laboratory. Secondary Alexa 488- and Rodamine Red X-labeled Abs, streptavidin, and fluorescent trackers chloromethyl derivative of aminocoumarin (CMAC) and chloromethyl-benzoylamino-tetramethylrhodamine (CM-TMR) were obtained from Molecular Probes (Eugene, OR). Biotin-conjugated anti-hamster IgG was purchased from BD PharMingen. Recombinant human fibronectin (FN), poly-l-lysine (PLL), and superantigen staphylococcal enterotoxin E (SEE) were obtained from Toxin Technology (Sarasota, FL). CD81-GFP was obtained by PCR amplification of the human CD81 cDNA (a gift from Dr. S. Levy, Stanford University Medical Center, Stanford, CA) and cloned in the pEGFP-N1 vector (Clontech Laboratories, Palo Alto, CA). Raji or Jurkat cells were resuspended at 2 × 107 cell/ml in Optimem-1 (Life Technologies, Grand Island, NY) with 10 μg of pEGFP-N1-CD81 and electroporated at 1200 μF/250 V in a Gene Pulser II (Bio-Rad, Hercules, CA). To distinguish APCs from T lymphocytes, they were alternatively loaded with the fluorescent tracker CMAC (10 μM). APCs were incubated for 20 min at 37°C with 2 μg/ml SEE (Raji) or 1 μg/ml SEB (DC) or for 16 h with 1 mg/ml conalbumin (TAK; Sigma-Aldrich). Jurkat, S3 T cells, and SR.D10 (105 cells) were mixed with Raji cells (105 cells), DC (5 × 104 cells), or TAK (105 cells), respectively, and incubated for 15 min at 37°C. Cells were plated onto PLL (50 μg/ml)- or FN (20 μg/ml)-coated slides, incubated for 30 min at 37°C, and fixed in 4% formaldehyde. For immunofluorescence assays, samples were blocked with TNB (0.1 M Tris-HCl, 0.15 M NaCl, 0.5% blocking reagent; Boehringer Mannheim, Mannheim, Germany) and FcR were blocked with human γ-globulin (100 μg/ml; Sigma-Aldrich) or mouse serum (Sigma-Aldrich). After staining with primary mAb followed by an Alexa 488-labeled specific secondary Ab, samples were examined with a DMR photomicroscope (Leica, Mannheim, Germany) using Leica QFISH 1.0 software. For double staining, cells were incubated with the primary Ab followed by a goat anti-mouse Rhodamine Red X, saturated with mouse serum, and incubated with the biotinylated anti-CD81 and streptavidin-Alexa Fluor 488. Series of optical sections were obtained with a Leica TCS-SP confocal scanning laser microscope. 3D reconstructions of confocal sections (distanced 0.3 μm in the vertical axis) were assembled using Leica confocal software. Raji or Jurkat cells (6 × 105) transiently transfected with CD81-GFP in HBSS with 2% FCS were allowed to adhere on FN-coated coverslips. The other cell type (2 × 105), previously loaded with 5 μM CM-TMR was added to the chamber. Cells were maintained at 37°C in 5% CO2, and confocal images were acquired using the Leica TCS-SP confocal microscope. Confocal series of fluorescence and the differential interference contrast (DIC) images were simultaneously obtained. The maximal projection of the most representative sections of the green channel (GFP signal), the corresponding DIC image, and the red channel image (CM-TMR signal) were overlaid in a single image. It has been proposed that CD81 plays an important role in T-B cell collaboration, since CD81-deficient mice display altered humoral immune responses (13) and Abs against CD81 promote the formation of T-B cell conjugates (11). To address the involvement of CD81 in the interaction between T cells and APCs, we studied the localization of CD81 during IS formation. We first assessed the distribution of CD81 in a T-B cell interaction model that rendered functional IS (16). Raji B cells pulsed or not with SEE superantigen were conjugated for 10 min with Vβ8+ Jurkat T cells. CD81, which was homogeneously distributed in conjugates formed in the absence of SEE, localized in a discrete central cluster at the IS in the presence of SEE (Fig. 1⇓, a and b). Likewise, CD3 was concentrated at the T-B cell contact area when conjugates were formed in the presence of SEE (Fig. 1⇓, a and b). In contrast, CD45 was homogeneously distributed throughout the plasma membrane in these conjugates. (Fig. 1⇓a and the quantitative estimation in Table I⇓). CD81 localizes at the IS. a, Jurkat-Raji conjugates incubated for 10 min in the presence or absence of SEE were allowed to adhere to PLL, fixed, and stained (green) for CD3, CD45, and CD81. DIC images merged with blue fluorescence images from CMAC-loaded Jurkat cells are shown. b, DC and the nontransformed human T cell clone S3 were allowed to conjugate for 10 min in the presence of SEB, adhered to FN-coated coverslips, fixed, and stained for CD3, MHC class II, CD45, and CD81. DIC images are shown. c, TAK cells were incubated for 16 h with conalbumin, conjugated with SR.D10 cells, fixed, and stained (green) for CD3, ICAM-1, CD45, and CD81. DIC images merged with blue fluorescence images from CMAC-loaded TAK cells are shown. To add more generality to our observations, we studied the localization of CD81 in a nontransformed model of Ag presentation. Human monocyte-derived DCs pulsed with SEB were allowed to conjugate for 10 min with the nontransformed human T cell clone S3 CD4+ (16). 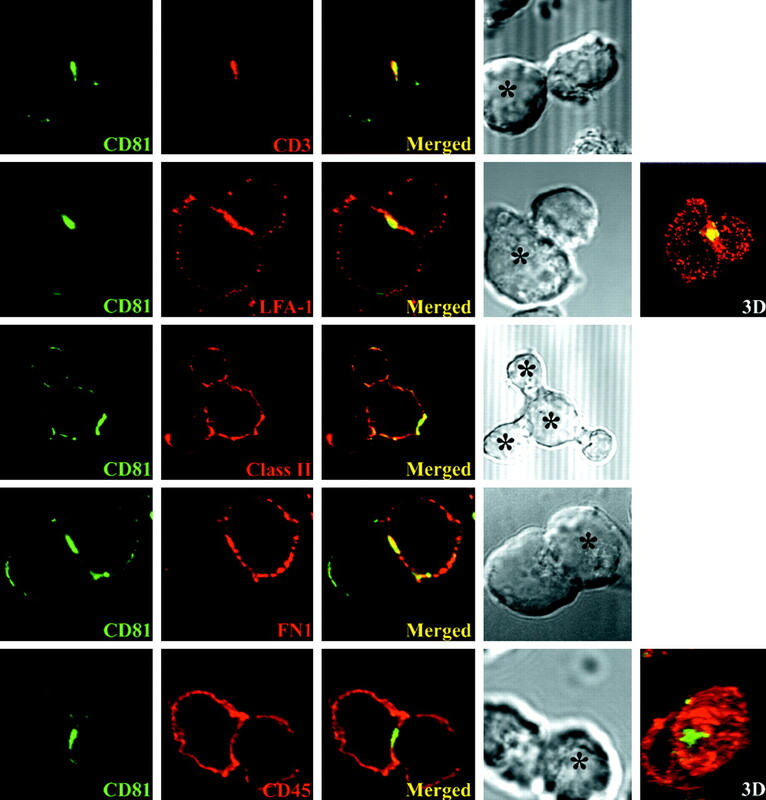 Synapse markers, such as CD3, concentrated at the T-DC contact area, whereas CD45 was uniformly distributed throughout the cell surface in these conjugates (18) (Fig. 1⇑b and Table I⇑). Furthermore, MHC class II molecules accumulated selectively at the APC site where the T cell bound. In these cellular conjugates, CD81 also clustered at the contact area (Fig. 1⇑b and Table I⇑). Finally, the localization of this tetraspanin was examined in the murine T cell line SR.D10 that recognizes a peptide of conalbumin presented by a I-Ak-transgenic B cell line (TAK) (17). In these peptide-driven cell conjugates, CD81 also localized in a discrete cluster in the center of the interaction (Fig. 1⇑c and Table I⇑). As expected, CD3 is localized in the center of the IS, ICAM-1 is segregated to the periphery of the contact, and CD45 is homogeneously distributed. Together, these data demonstrate that CD81 localizes at the IS in an Ag-dependent manner. The precise localization of CD81 within the IS topography was determined by confocal microscopy in SEE-dependent Jurkat-Raji cell conjugates. As shown in Fig. 2⇓, CD81 colocalized with CD3 at the c-SMAC. The fluorescence intensity of CD81 in the IS was ≈20-fold higher than the rest of the T cell or APC membrane fluorescence (Table II⇓). LFA-1 accumulated in the p-SMAC of the IS surrounding the c-SMAC containing CD81 (Fig. 2⇓ and Table II⇓). Both B cell-B cell homotypic and T cell-B cell heterotypic interactions were observed, but only in the latter conjugates was CD81 concentrated at the contact area partially colocalizing with MHC class II molecules. Remarkably, the FN1 determinant that recognizes a subset of MHC class II molecules associated with different tetraspanins (10), only colocalized with CD81 in the c-SMAC (Fig. 2⇓ and Table II⇓). CD45 was excluded from the contact area in these conjugates. These results indicate that CD81 redistributes to the contact area, and it is mainly localized at the center of the IS, colocalizing with CD3. CD81 segregates to the c-SMAC of the IS. Jurkat-Raji cell conjugates were incubated for 10 min in the presence of SEE and double stained for CD81 (green) and CD3, LFA-1, MHC class II, FN1, or CD45 (red). DIC images and some 3D reconstructions are shown. ∗, APCs. Both Raji and Jurkat cells express high levels of CD81 as determined by flow cytometry analysis (data not shown). Thus, staining of endogenous CD81 did not allow discrimination of the cellular source of CD81 localized at the IS. Therefore, we performed experiments with T cells or APCs that transiently expressed CD81-GFP. 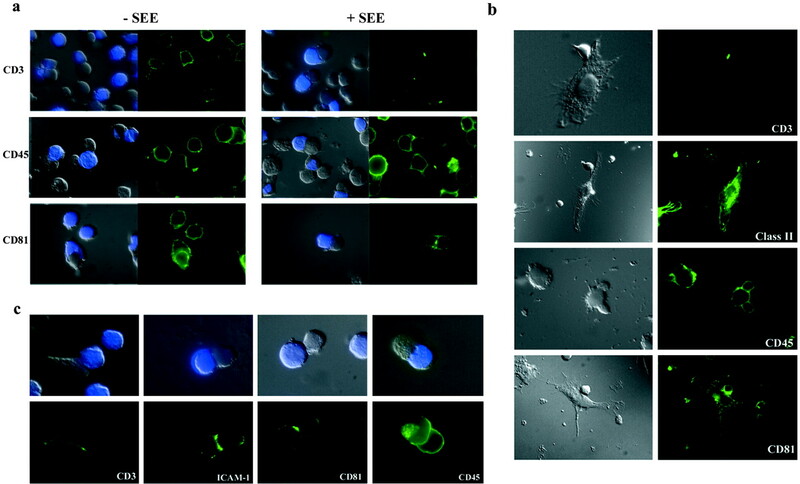 In transfected Raji or Jurkat cells, a large amount of the total GFP fusion protein was retained intracellularly in the Golgi apparatus, as determined by costaining with giantin, a Golgi-specific protein (data not shown). These data concur with previous reports showing tetraspanin localization in internal vesicles (19). Plasma membrane CD81-GFP transfected in Jurkat cells colocalized with CD3 at the cell-cell contact area (Fig. 3⇓a). In addition, Golgi apparatus containing intracellular CD81-GFP was translocated to the IS proximity (Fig. 3⇓a). The clustering of plasma membrane CD81-GFP at the c-SMAC is only distinguishable before the vesicular structures localized in close apposition to the IS. A total of 92% of conjugates on which CD3 localized into the c-SMAC also displayed the T cell-CD81-GFP translocated to the IS. 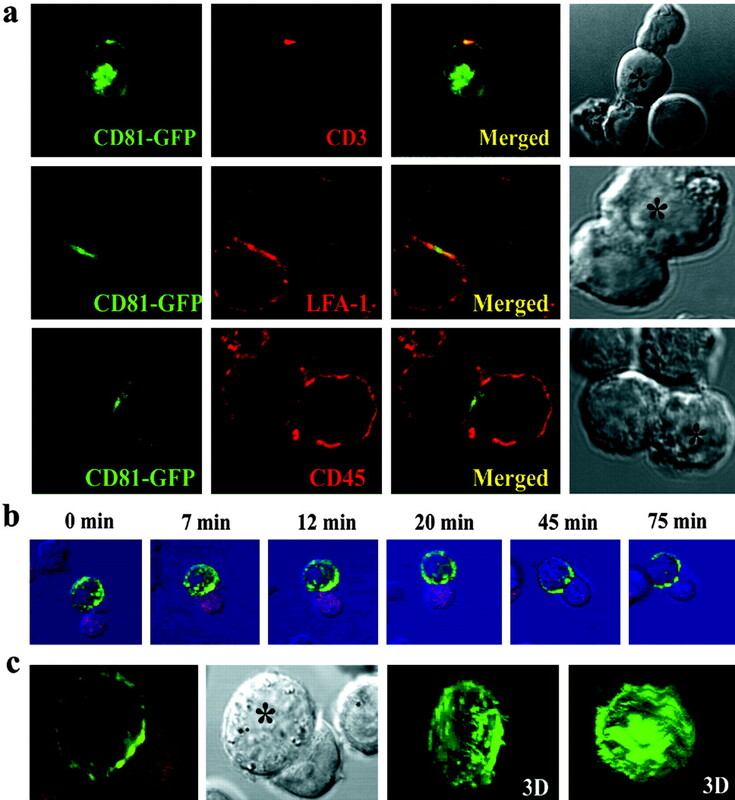 The dynamics of CD81-GFP during the T cell-APC interaction was determined by time-lapse confocal fluorescence videomicroscopy. At the T cell side, CD81-GFP immediately concentrated on the plasma membrane at the T cell contact area with the APC (Fig. 3⇓b). Within the first 10 min, Golgi apparatus translocated to the contact zone, where it remained along the time tested (2 h; Fig. 3⇓b). Dynamics of CD81 at the T cell side of the IS. a, Jurkat cells expressing CD81-GFP were allowed to conjugate for 10 min in the presence of SEE with Raji cells, fixed, and stained for CD3, LFA-1, and CD45 (red). DIC and 3D images are shown. ∗, APCs. b, Jurkat cells transiently transfected with CD81-GFP were seeded onto FN-coated coverslips. Then Raji cells labeled in red with the probe CM-TMR were incubated with SEE and added to the chambers. Cells were monitored by time-lapse confocal microscopy at 30-s intervals. Representative images are shown. Each time point shows the DIC image overlaid with the fluorescence images of Raji cells (red) and CD81-GFP fluorescence (green). 3D reconstructions at the initial and the final time are shown. Next, CD81-GFP was analyzed at the APC side of the IS. Membrane CD81-GFP localization at the APCs coincided with that of CD3 at the c-SMAC of the T cell and was surrounded by the LFA-1 p-SMAC ring. A total of 65% of conjugates where CD3 was localized at the c-SMAC showed clustering of CD81-GFP from Raji cells at the IS. In contrast to what happens in the T cell, the APC Golgi CD81-GFP pool was not translocated at the contact site in mature IS (Fig. 4⇓a). Dynamic studies showed that CD81-GFP immediately relocalized at the IS after the contact with the T cell, forming a large cluster at the center of the IS. Subsequently, the central cluster became more discrete and waves of CD81 accumulated in the periphery of the IS, where they remained for at least 3 h (Fig. 4⇓b). 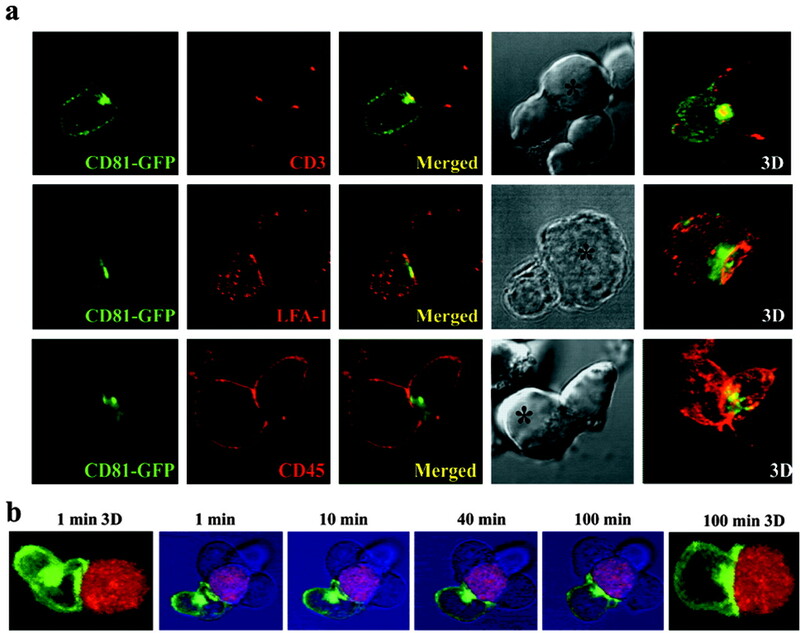 3D reconstruction of multiple confocal sections of a Raji transfected with CD81-GFP interacting with a T cell after 45 min revealed that CD81 expressed by the APCs formed an incomplete ring around its central accumulation (Fig. 4⇓c). This structure was also frequently observed in late T-B interactions with endogenous proteins (CD81-MHC class II costaining; Fig. 2⇑). Therefore, both T cells and APCs contribute to the clustering of CD81 at the IS, although its dynamic distribution differs in both cell types. Dynamics of CD81 at the APC side of the IS. a, Raji cells expressing CD81-GFP were allowed to conjugate in the presence of SEE for 10 min with Jurkat cells and stained for CD3, LFA-1, and CD45 (red). DIC images are shown. ∗, APCs. b, Raji cells expressing CD81-GFP were incubated with SEE and adhered onto FN-coated coverslips. Jurkat cells labeled in red with CM-TMR were added to the chambers, and IS formation was monitored by time-lapse confocal microscopy. Images were taken at 30-s intervals. Representative images are shown. Each time point shows the DIC image overlaid with the fluorescence images of Jurkat cell (red) and CD81-GFP fluorescence (green).c, High magnification of a T cell (red) interacting with a Raji cell expressing CD81-GFP. A single section, the DIC image, and two different angles of green channel 3D reconstruction are shown. ∗, APCs. Clustering of CD81 at the IS strongly suggests that this tetraspanin may play important roles during Ag presentation. Conceivably, its possible involvement in the recruitment of signaling molecules, such as classical protein kinase C (20) or phosphatidylinositol 4-kinase (21) to the IS, would explain its costimulatory effect during T cell activation (7). Accordingly, CD81 and signaling molecules associated could be driven by CD4/CD8 on T cells and by class II on APCs, and the whole complex translocated to the IS. In addition, CD81 and other tetraspanins could act as facilitators of Ag presentation by creating domains on the APC plasma membrane that contain specific class II molecules, defined by the FN1 epitope, which carry a restricted set of antigenic peptides (10). Alternatively, CD81 could strengthen intercellular adhesion during T-APC interaction, as has been reported to induce LFA-1 activation (11). In this regard, our results on the different localization of both molecules within the IS suggest that the mechanism of CD81-mediated LFA-1 regulation is independent of a direct association between these molecules and that is likely mediated by signaling moieties associated with tetraspanins. Finally, it is possible that the presence of CD81 at the IS plays an essential role during Th1/Th2 polarization, as suggested by CD81 null mice data (15). Together our results on the dynamic behavior of CD81 at T-APC cooperation reveal that CD81 is playing an active but distinct role at both the T and APC sides during IS formation. The critical reading of this manuscript by Dr. Roberto Gonzalez Amaro is acknowledged. ↵1 This work was supported by Grants BMC02-00536 and European Community QLRT-1999-010-36 (to F.S.-M.). M.M. was supported by Grant Formacion del Profesorado Universitario AP2000-0279 from the Ministerio de Educación, Cultura y Deporte. ↵3 Abbreviations used in this paper: IS, immune synapse; c-SMAC, central supramolecular activation complex; CMAC, chloromethyl derivative of aminocoumarin; CM-TMR, chloromethyl-benzoylamino-tetramethylrhodamine; DC, dendritic cell; DIC, differential interference contrast; FN, fibronectin; GFP, green fluorescent protein; p-SMAC, peripheral SMAC; PLL: poly-l-lysine; SEB, staphylococcal enterotoxin B; SEE, staphylococcal enterotoxin E; 3D, three dimensional.